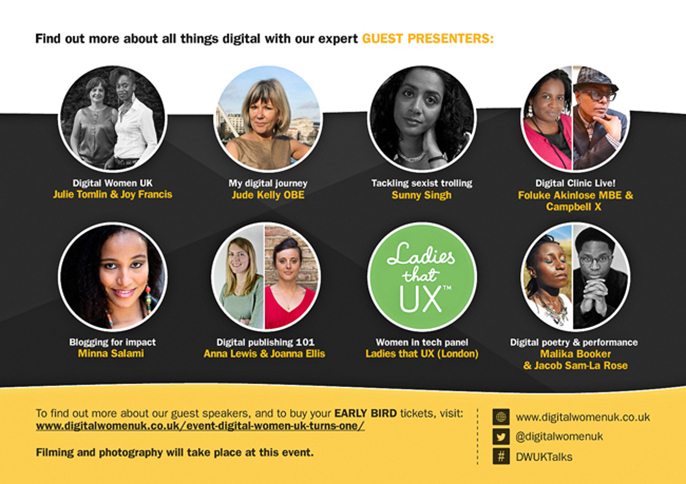 Black women creatives are being given the chance to get social media savvy and hear from, and network with, digital experts at ‘Get Connected’, a one day event on Tuesday 30 September to celebrate Digital Women UK’s first anniversary. Get Connected will host a dynamic mix of social media, technology and arts experts, such as the award-winning blogger, MsAfropolitan founder and The Guardian Africa Network contributor Minna Salami, digital pioneer and founder of PRECIOUS Foluke Akinlose MBE, digital strategist and award-winning filmmaker Campbell X, novelist and social media campaigner Sunny Singh with special digital poetry performances by acclaimed spoken word artists Malika Booker and Jacob Sam-La Rose. Jude Kelly OBE, artistic director at the Southbank Centre, will make an exclusive film presentation for the event with contributions from event contributors Ladies that UX (London), The Literary Platform, CompletelyNovel, Valobox and The Body Narratives. Digital Women UK was founded in 2013 by Joy Francis and Julie Tomlin, Digital Women UK to facilitate female creative practitioners to fully engage with social media to raise their profile, showcase their work and reach their target audiences, and provides training and develops campaigns for more inclusion online.